Helping or being assistance to others who have suffered trauma is an honorable means of serving others. However, in providing support for a trauma survivor does not come without cost. Health professionals, caregivers, and emergency responders (police, firefighters, EMS) are at risk of suffering trauma vicariously. 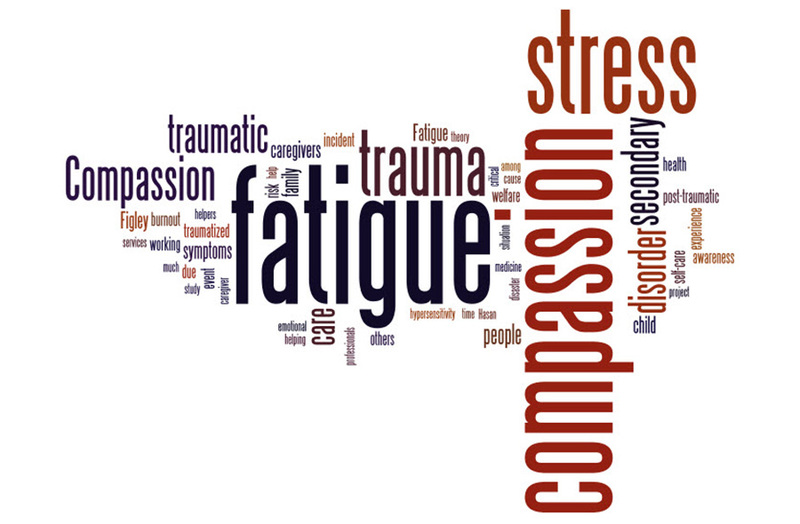 Compassion Fatigue, known as a secondary post-traumatic stress disorder, arises from working with those who have suffered from traumatic life events. No one is immune Secondary Traumatic Stress/Vicarious Traumatic Stress (STS/VTS). In discussing the dynamics of STS, one must first explore transference and counter-transference. Generally these terms relate to the field of psychotherapy, but for all intents and purposes, health professionals, caregivers, and emergency responders fulfill a quasi-role of therapist when assisting others who have suffered trauma. By definition, transference is the identification of childhood emotions of the client mistaken as emotions toward the therapist. These emotions can be friendly, hostile or ambivalent. Counter-transference is much the same, where the therapist identifies with similar emotions and mistakes these emotions as those associated with the client. Whether providing care for a recent trauma survivor or one who is experiencing Post Traumatic Stress Disorder (PTSD), Trauma Specific Transference (TST) can occur: where the individual assisted places the caregiver into the role of rescuer, perpetrator, or supporter. Likewise, the caregiver may fall into the role of fellow survivor, supporter, or rescuer through counter transference. Those suffering from STS, exhibit symptoms such as hopelessness, a decrease in experiences of pleasure, constant stress and anxiety, sleeplessness or nightmares, and a pervasive negative attitude. Often self-medicating with illicit drugs and/or alcohol enters into the picture in order to abate the emotional impact experienced. In turn, the STS sufferer experiences a decline in physical health and damage to personal and professional relationships, including a decrease in productivity, the inability to focus, and the development of new feelings of incompetency and self-doubt. Treatment of STS includes professional counseling, attending support groups, realizing the impact of working with traumatized individuals, attending workshops, limiting exposure to traumatic materials (e.g. books, television shows, and movies), exercising spiritual practices such as prayer, and staying connected to others. Prevention of STS begins with maintaining clear boundaries between home and work. Additional prevention measures are scheduling time off work, engaging in regular physical activity, journaling, pursuing hobbies, meditation, listening to music, socializing with family and friends, informal group therapy with coworkers, eating a balanced diet, getting plenty of sleep, performing group guided exercise (Yoga/Thai Chi/Zumba), deep breathing exercises, and receiving professional massage therapy and/or Chiropractic sessions. Amongst the aforementioned prevention techniques, deep breathing is free, can be performed at any time, and impacts the entire body exponentially. Deep breathing, correctly utilizing the diaphragm, affects every system of the body directly. Proper utilization of the diaphragm (diaphragmatic breathing aka belly breathing) releases pressure from the cervical and lumbar spine, freeing up entrapped nervous tissue, reversing the fight or flight environment perceived by the brain, and thus reducing anxiety and depression. Diaphragmatic breathing (aka belly breathing) is simple to perform, yet awareness needs to be developed. Most people either shallowly or chest breathe and quite often, and need to retrain themselves to make full use of their diaphragm. This is carried out by placing your hands on your abdomen, breathing in through the nose until the abdomen extends fully, and passively exhaling the breath through the mouth. Through continued practice, this form of breathing becomes more automatic, becoming a first line of defense in the prevention if Secondary Traumatic Stress. In today’s chaotic world, most do not pay attention to how they are breathing. Chest or shallow breathing effectively cuts off the upper from the lower body and creates a physical imbalance in the body and a chemical imbalance in the blood and brain. This imbalance creates what we term as stress. Chronic stress has become business as usual and being hurried, rushed, or too busy are symptoms of stress. 6a. A mentally or emotionally disruptive or upsetting condition occurring in response to adverse external influences and capable of affecting physical health, usually characterized by increased heart rate, increased respiration, a rise in blood pressure, muscular tension, irritability, and depression. b. A stimulus or circumstance causing such a condition. 7. A state of extreme difficulty, pressure, or strain. Stress encourages the “fight or flight” response in the body. The nervous system reacts by releasing a number of hormones very rapidly. One of these hormones, adrenaline, has several effects on the body, to include an increase in respiration and heart rate. People who chest breathe tend to hold in their stomach, make little use of the diaphragm, and breathe using the muscles of the upper chest, neck, and shoulders. When taking a deep breath, the chest breather visibly lifts the entire chest up away from the diaphragm, therefore creating more space in the thoracic cavity, rather than allowing the diaphragm to pull the air in. This type of breathing becomes automatic, and the body adjusts volume and rate as it does in diaphragmatic breathing. Chest breathing encourages the muscles in the neck, chest, and shoulder area to become tight and weak. This means that the lungs are given less room to expand or contract and that the body must work harder. As breath volume is lowered, respiration must be sped up in order for the body to maintain balance. From this we can infer that chest breathing can create stress and vice versa. Sitting or laying comfortably (legs uncrossed), placing your hands on your stomach. Begin by taking a deep breath through the nose, expanding abdominal area, and making your hands on your stomach rise. Breathe out through the mouth, completely emptying the lungs. Repeat until you are comfortable with belly breathing. Do not hyperventilate. Continue this breathing at your own pace until it becomes natural to you. DO NOT HYPERVENTILATE! Symptoms of hyperventilation include light-headiness, tingling in the lips, face, hands, and scalp. By practicing diaphragmatic breathing on a regular basis, overall stress will be reduced dramatically, your well-being will be accentuated, and you will feel more grounded and centered during life’s most adverse situations. Be well! What Happens in Vagus Does Not Stay in Vagus! Cardiovascular disease, stroke risk, high blood pressure, and neurological disorders (e.g. Peripheral neuropathy) associated with diabetes have long been considered contraindications to receiving massage therapy. However, with a doctor’s clearance, a therapist with advanced training may provide effective treatment for the diabetes sufferer. Massage therapy is effective in improving circulation, lymphatic functioning, central nervous system response, and reduction of blood pressure. During a massage therapy session, the body’s nervous system is affected through the manual manipulation of the soft tissues of the body. 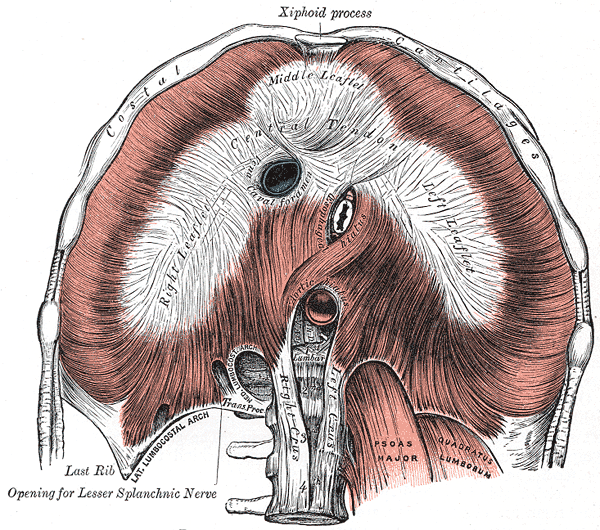 The 10th cranial nerve, the Vagus nerve, is considered to be the master nerve of the body. Vagus is Latin for wandering, aptly describing its path as it descends from brain stem, becoming encased within the sheath containing the jugular vein and carotid artery, and eventually traveling with the esophagus (through the diaphragm) into the abdominal cavity. It serves as a primary conduit of information between the brain and the heart, lungs, and digestive system. More importantly, for diabetic patients, the vagus provides the energy for the endocrine functioning of the pancreas. Massage therapy assists in reducing the pressure and tension the musculoskeletal system places upon the vagus, allowing it to communicate more efficiently with the brain. Type II and gestational diabetes patients may favorably respond to carefully applied manual therapy techniques. The simplest way for the diabetes patient to reduce pressure on the vagus is to breathe. The respiratory muscles in the neck, upper chest, and abdomen (diaphragm) often constrict the vagus when the patient has developed the habit of chest or shallowly breathing. Reversing this pattern requires the mobilization of the diaphragm, the master respiratory muscle, otherwise known as diaphragmatic breathing. 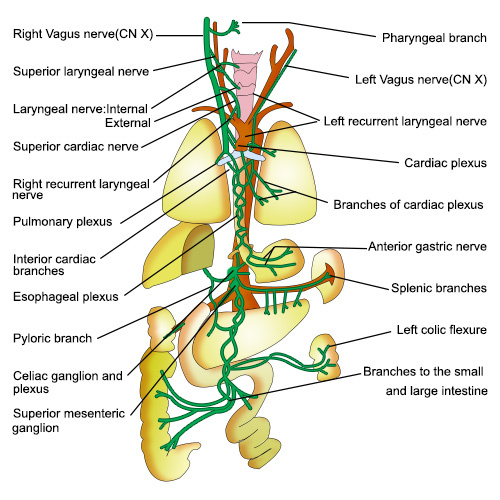 The vagus nerve is thought to regulate the body’s fight or flight and autoimmune response. When the vagus is affected, the entire body is affected. Hence, what happens in vagus does NOT stay in vagus! Take the time to free the vagus ~ Stop, Breathe, and BE. 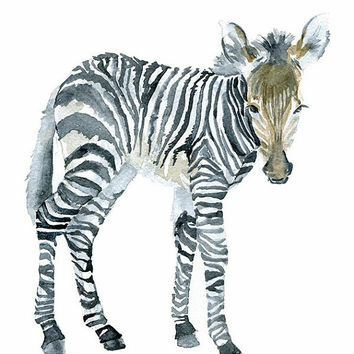 “When you hear hoof beats behind you, don’t expect to see a zebra”, was coined in the late 1940s by Dr. Theodore Woodward, a former professor at the University of Maryland School of Medicine. Dr. Woodward was teaching his students the importance of not jumping to conclusions, focusing their attention on obtaining a complete patient history before presenting a diagnosis and treatment plan. The world today is a much different place than it was for Dr. Woodward in the ‘40’s. Information that was once only found in the medical community is now easily found on the internet. Rather than seeking medical treatment for a condition, many will self-diagnose and self medicate. Many people may be successful in understanding and treating their body well. However, there are common mistakes an individual can make in self-diagnosing and treatment. In my experience of treating clients, deficiency of proper hydration, calcium, and oxygen are common denominators to the root cause of pain and dysfunction. Water, calcium, and oxygen are the 3 most important elements to the functioning of the body. Water, because over half of the mass of the body is water, and dehydration triggers muscle spasm. Calcium is needed not only for strong teeth and bones; it is also a catalyst to the functioning of the nervous system. Too low dietary calcium can lead to chronic muscle spasm and joint dysfunction. And oxygen, inarguably the most important element to life, is essential to properly working musculature. A common example of self-diagnosing and self-treatment is sinus congestion. Many who suffer from chronic sinus congestion may treat the condition with antihistamines and decongestants. However, allergies may not be the cause for sinus congestion. The sinuses are hollow areas within the facial bones connecting to the nasal cavity via a small structure called the sinus ostium (pl.ostia). A tight scalp and facial musculature can place pressure on the ostia, causing inflammation and blockage. When the ostia become blocked, there is an accumulation of fluid in the sinuses, causing congestion. If you suffer from a chronic condition or pain, take the time to get checked out by a health professional. Share your self diagnosis and the reasons for your deduction. You may be correct. However, in the event that you have heard hoof beats, have seen a Zebra, and your self-treatment is not working, it is probably time to make an appointment with your doctor or other health professionals that can correctly diagnose and treat your condition. Stop, Breathe, and BE well!